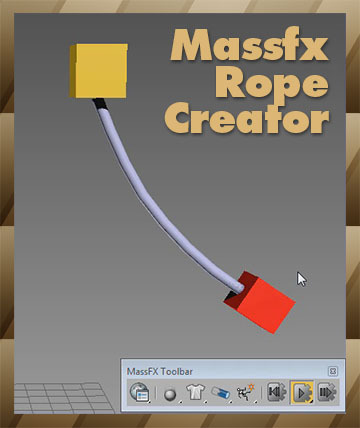 The fastest solution to create ropes for your Massfx simulation which allows you to create a rope between 2 objects automatically! 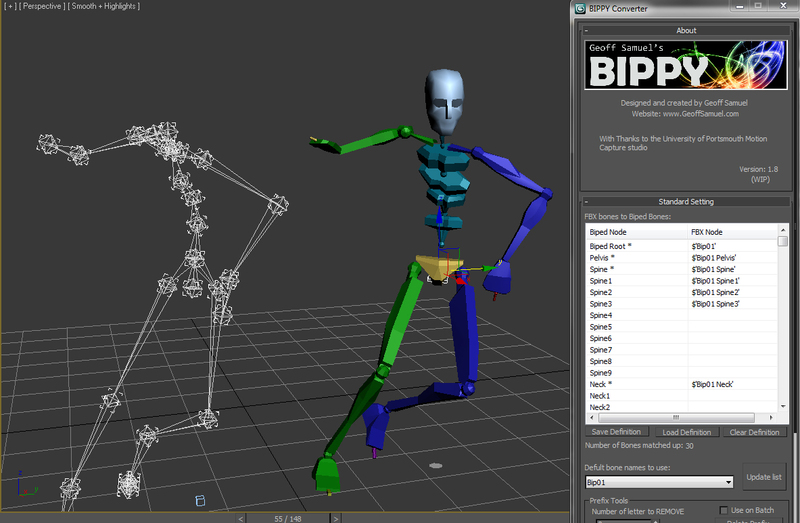 Bippy is a tool for converting FBX bone data onto a 3ds Max Biped and offeres serveral tools to help optimize this conversion pipline. Its perfect for motion capture data when the client needs the data in a biped format. This is an advanced toolset for rigging. For a full features list refer to the included readme. Script for automating the process of getting 3dsMax's native stretchy bones into any game engine: creating a separate de-hierarchized bone structure that follows the motion of the base bone structure and automatically migrating skin weights on a mesh to those new bones. Select the bones that you want to be affected with "Pick bones" button. Select the affected mesh with a skin modifier with "Pick skinned object" button. Press "Convert and reskin" button. This tool will change the color of bones based on their squash/stretch amount, providing the user with feedback if they have gone beyond a desired threshold. It will live update as you move around and animate in the viewport. Very flexible and fast script to generate a bone based skeleton over the 3ds max's biped. This script creates an entire rig from Bip character. If you don't have time to create all roll bones, and repeat all the same on the mirrored side, just create Bip and set up it's proportions, run the script and magically you will have a brand new rig. To start, just create biped, custom it in figure mode to match your character. When done, create a new empty layer, select any bip element, and click on script button. Bones will be created automatically on biped structure. Autoweight is a script designed for 3D Studio Max helping you speeding up the skinning process of characters and machines. You define special polygon regions and the script finds the appropriate bones, calculates the appropriate skin-vertices and sets up smooth transitions between those regions. There are also Youtube video tutorials explaining the script step-by-step. The new version 1.0 comes with an installer so you don't need to hassle around with the mzp-stuff anymore. Biped Manipulator - MAX script, allows to select fast any objects/bones and also the whole groups of objects as arms, legs and spine. Since manipulator uses objects names to select objects/bones it is posible to use it with any riggs sytems like Character Studio, CAT, custom riggs etc. Biped Manipulator doesn't occupy much screen place. If there are several bipeds on the scene it is possible to use for convenience several Biped Manipulators. If anyone could help me figure out how to make this adjustment to this script that would be awesome! Either way it is a powerful script for using bones to rig a tentacle. I am planning to use a blend bone between this wave rig by Felix and an Ik system. If anyone could help me out that would be GREAT! After setting up a biped to your character's base pose, use this tool to create a base skeleton rig. Since you are using biped, you can scale the rig into place, and utilize its mirror function so you only have to do half the side. Then run the tool, and the rig will be made.